Jeju Island of South Korea – "Sometimes You Have to See, to Believe"
Jeju is an oft-quoted island, said to be of exceptional natural and cultural splendour, that virtually all Koreans are proud of it — so much so that the Seoul-Jeju air route is said to be the busiest in the world! However what attracted us to Jeju is its UNESCO World Heritage Site listing and also its induction into the New Seven Wonders of Nature … but what really prompted us to visit Jeju was, while waiting to ascend the famed Table Mountain of Cape Town in a cable car a few months ago, we saw a poster of the New Seven Wonders of Nature, which showed, in addition to the Table Mountain: Amazon Rainforest, Iguazu Falls, Ha Long Bay, Puerto Princesa Underground River, Komodo Island … and Jeju Island! So now we have been to three of them: Ha Long Bay (2006), Table Mountain (2013), Jeju Island (2013). 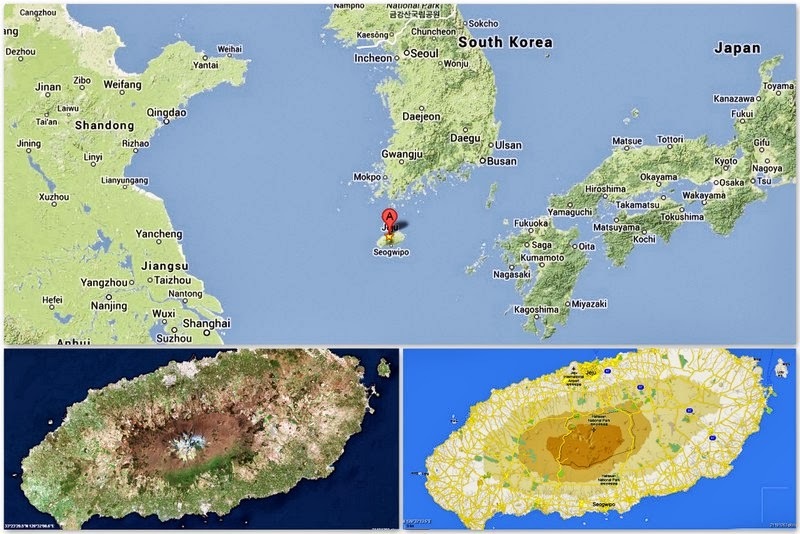 So where is this Jeju Island? For one thing it’s volcanic in origin, which gives it a rather unique but interesting geology. We can imagine it as the peak of a huge extinct volcano which rose from the floor of the East China Sea millions of years ago. In the middle of the island, looking like a festering boil, are the peak and crater of Mt Halla, the highest mountain in South Korea at 1950m. In fact the whole island is covered with fertile black soil and hard lava rocks, and that’s why Jeju is one interesting spot. These are our Jeju stories.